1. Thank you everyone for the kind words about my vloging* attempt. Based on the feedback, I’ll be doing lot more of this. In fact, I’ll be taking questions on my Twitter feed this afternoon, so if you have something you want me to answer on camera, let me know. I will try to post the next vlog tonight or tomorrow. You should subscribe to my YouTube channel so you don’t miss a scintillating moment. *blog + video = vlogging I am still looking for a better word. 3. I finished recording all the PSAs for next month’s 25th anniversary of School Library Month, thank goodness. 4. Have you read my guest blog on TeachingBooks.net? Why not? It explains why I call myself the Mad Woman in the Forest. While you are at TeachingBook.net, listen to the very short audio clip of me explaining the correct pronunciation of my name. 5. 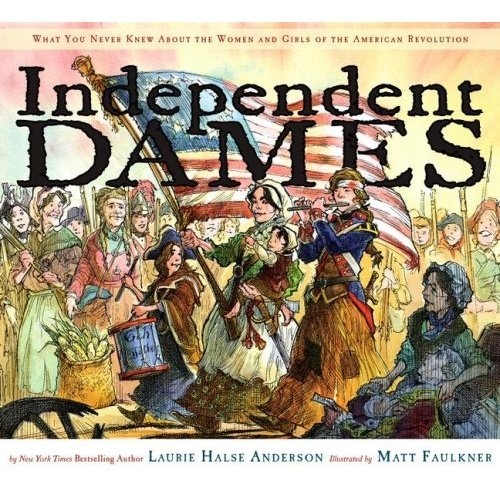 Just in time for Women’s History Month, check out this wonderful librarian’s review of INDEPENDENT DAMES. Although the publisher put "grades 2-6" on the jacket, I have long argued that it is perfect for middle school classrooms that are studying the American Revolution. This teacher agrees with me. What do you think? It finally rained last night and I slept in. I feel like declaring today to be a national holiday. Another faithful reader of the blog posed a few publication questions yesterday: Have you ever spent time (be it weeks, or months) on a story proposal to the publisher and they (for whatever reason) turned it down? If so, how did you feel about it having put all that time and effort into it and then have it get slapped down? Or….do you suggest ideas that may interest you and submit it to them first so that you don’t waste any time on it? Funny you should ask, because yes, I’ve gone through that. I am one of those folks who has acres of rejection letters from just about every publisher in America. Nobody likes rejection. When I was breaking into this field, I must have proposed at least fifty different non-fiction book ideas to various and sundry publishers. With the crystal-clear glasses of hindsight, I can see now that most of them were bad ideas. Some of them were good ideas, but I either a) did a poor job explaining how the book would be structured or b) because I was still a pre-published author, no one was going to take a chance on me, so I should have written the whole thing without a contract and then tried to sell it. Let me tell you the story behind INDEPENDENT DAMES. It started in the mid-1990s. I wanted to write a book that would highlight the Revolutionary War exploits of six unknown heroines, and I wanted the book to put the roles of women and girls in the Revolution in context of the larger war and society. Nobody wanted the book. They all sent me form rejections. I had done a fair amount of research and had enormous files stuffed with information, but I realized the idea wasn’t going anywhere, so I packed them away in my drawer. Over the next five years, I had a number of picture books and novels come out. At Simon & Schuster, I published FEVER 1793 and the editors there knew loved American History. They also knew (because of my earlier picture book, TURKEY POX (now out of print)) that I loved Thanksgiving. One of the editors suggested I investigate the exploits of Sarah Josepha Hale. There was no promise, no contract. I researched and wrote and researched and wrote and sold THANK YOU, SARAH to those editors a couple years later. SARAH (illustrated by Matt Faulkner) turned out so well, the editors asked if I had another historical subject I’d like to pursue with the same illustrator and format. I brought up the idea about women in the American Revolution, thinking about that treasure chest laying in my file cabinet. The editor liked the concept, but encouraged me to go beyond six women, far beyond. I went home and did oodles more research and wound up with eighty-nine women and girls. I put together a giant proposal, including biographical information on each woman, sent it in and was offered a contract. Which is a long story. I guess the moral is, don’t throw out your old files and keep moving forward. Note for next week: Colleen at Chasing Ray has suggested we use this week to discuss some of the issues that have been brewing in the kidlitosphere. Are you interested? Today’s goal: Write for 15 minutes. Then take a nap. Today’s mindset: adapting to overcome. Today’s prompt: This combines observation with perspective. 1. Describe what your house or backyard looks/feels/smells like to a four-year-old. Don’t write more than four paragraphs. 2. Now describe the same place from the Point Of View of a fourteen-year-old. 3. Now describe the same place from the POV of an eighty-year-old.